In marketing, you often find the presentation of products as a bundle of benefits that the consumer obtains. What does this concept exactly mean and how can features be converted into benefits? Why is it important to understand products as a bundle of benefits rather than as a bundle of features? The concept of product as a bundle of benefits is a theory which seeks to explain a product from the viewpoint of a consumer. If you think about a product that you buy – do you buy it because of the features it offers or because of the benefits you will receive through these features? Clearly, the benefits is what you are buying. This explains why marketers should from the very first moment of new product development look at products from the viewpoint of customers to understand which benefits must be the result in the end. Let’s contrast the two perspectives you can take on a product. From the producer’s viewpoint, a product is the end result of combining factors of production, such as labor and raw materials. However, from a customer’s viewpoint the product is defined by the benefits it provides. Since marketing involves seeing everything the firm does from the viewpoint of the customer, marketers define products as a bundle of benefits. To understand products as a bundle of benefits, you must first understand the difference between a feature and a benefit. A product feature is something that describes the product in terms of its physical characteristics. For example, a book might be described as having easy-to-read print, two case studies per chapter and a soft cover. This would accurately describe the book, but it would not tell the book purchaser why these features are of any use at all. For features to be converted to benefits, the marketer needs to explain to the consumer what each of these features means. In our example, easy-to-read print may mean that the reader will not get tired reading the book. Two case studies per chapter may mean that the content is placed in a real world context which simplifies understanding. A soft cover means that the book is lighter to carry and cheaper than a hardback version. To fully grasp the meaning of products as a bundle of benefits from the consumer’s perspective, let’s dive deeper into the categorization of benefits. The benefits of the product may be categorized by the customer in different ways. 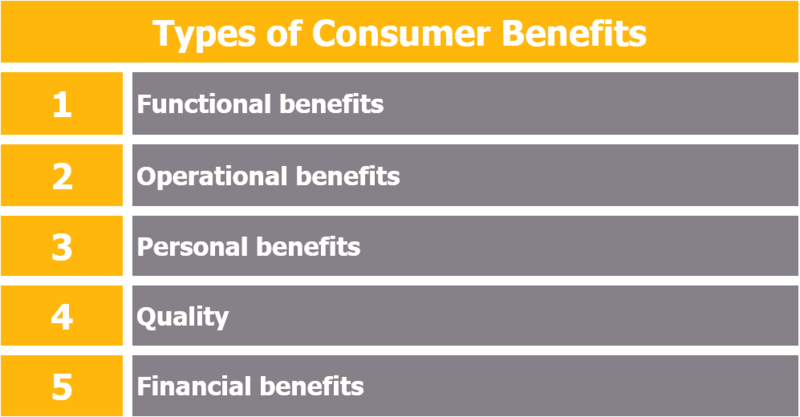 Products provide five different types of benefit, shown and explained in the table below. Functional Benefits: These relate to the product’s capacity for doing what the consumer expects it to do. Operational Benefits: These are like functional benefits but apply specifically to business-to-business markets. Operational benefits are those that influence the buyer’s production process. Personal Benefits: In many cases the product provides intangible, psychological benefits to the customer. These may be difficult for the marketer to gauge. Quality: Quality is the relationship between what someone expects and what they get. It is often judged by corporate reputation, the materials used in production, or even by looking at the price tag. Quality relates to expected performance. Financial Benefits: These relate to the investment potential of the product. In some markets these benefits may be very important: holiday homes, timeshare, insurance products, and of course savings accounts are all considered as investments. In others financial benefits might relate to the savings the product will make. Considering products as a bundle of benefits has several advantages to firms when planning promotional campaigns. Advertisers have long understood that ads should sell benefits, not features. In some markets, however, this principle seems to not have been understood yet. For instance, much of the computer hardware products seem to describe themselves in terms of features without explaining what the features mean. This is not necessarily a problem for a computer enthusiast, who can easily work out what a 3.10 GHz processor with 4 cores and turbo boost option will do, but for the average buyer this jargon needs to be explained. Doing so helps consumers fully understand the product and thereby develop interest and desire. The idea of a product as a bundle of benefits applies equally to service products, and from the viewpoint of a customer a service might provide much the same benefits as a physical product. Service benefits can be categorized along the same lines as physical goods.